* Set-Up is FULLY user PROGRAMMABLE! You are coming in for a landing. You slow your bird down and add your first notch of flaps. The first thing you notice is that you have to hold a bit more pressure on your elevator control stick or yoke to keep your bird on the same glide path. In order to relieve this back pressure you manually crank in a bit of elevator trim. This is repeatedly done for every notch of flaps that you crank in, all the way down to the runway. We constantly trim, trim, and re-trim to get this stick back pressure to zero. It happens more or less the same, for every landing and take-off. This is a very repeated task. Also picture yourself doing a touch and go. When you finally land, you may have quite a bit of elevator trim cranked in to compensate for your full flap position. You land, roll out, then retract the flaps and add full power to take-off again. The elevator trim you cranked in on landing, now has to be adjusted for your take-off attitude. This is usually done in the air while you are fighting the elevator back pressure and while doing other tasks. Up until now, "we the homebuilders", didn’t have a choice for a system to automate this trimming task. With the FPS-Plus, you can program specific flap positions, and associate elevator trim positions with each different flap setting. It is easy. After this is accomplished, the FPS-Plus will not only give you perfect flap control, it will also automatically adjust your elevator trim with every different flap position that you crank in. This dramatically decreases the pilot’s workload if he or she enjoys doing those go-arounds or touch and goes. For those of you that don't like the thought of pressing a button and automatically going from flap stop to flap stop, . . . the FPS-Plus can also be operated in the proportional mode (mode 2). The automatic elevator trim will also be adjusted for every flap position even if you want to operate your flaps manually. This gives you the same accurate trim positioning that you would operating in the "flap stop to flap stop" mode (mode 4 or 6). The reason I designed, built, and tested this device in my aircraft, is because when I lowered my flaps, I had to also crank in a good amount of elevator trim to keep the nose of my aircraft from diving. I believe that the "more forward center of gravity characteristic" of my aircraft contributes to the more exaggerated attitude change when I change its flight configuration by adding a notch or two of flaps. I really have to pull back on the control stick with a good amount of pressure to keep the nose of my bird in the air. I need full up elevator trim to compensate for a full down flap setting when landing to eliminate my elevator stick pressure. Like many other homebuilders, my aircraft turned out a little nose heavy. YES, I stuffed a large engine under the cowling, and on the end of it, there sits a heavy constant speed prop! And no, I didn't put my large battery in the baggage compartment either. I put it where the plans suggests, right near the firewall. One thing I must say for my critics, . . is that my aircraft "is" within the center of gravity limits published by the airframe manufacturer, Van's Aircraft, even with all variations of pilot, passenger, and baggage loads. Most experimental aircraft companies strive to design their aircraft around the perfect design, but sometimes "we homebuilders", pack too many goodies in there and forget about the balance and the flight characteristics until the very end of the project. When we finally find out the balance is not quite as good as it could be for a perfect flying aircraft, it's too late to change the major items. We just live with the way the bird finally flies, and sometimes we have to trim, trim, trim. Even if you are lucky, and your bird turns out perfect in the weight & balance arena, your particular aircraft's flight characteristics may also cause you to add a good bit of elevator trim when you change your bird's flight configuration. I found out early on, that when I landed my aircraft, and I had full flaps in, I always had FULL up elevator trim as well. I needed to do this to relieve the stick back-pressure on final approach. This happened on every landing, every time, and very repeatable. Because of this, I never really did many touch & goes because of this characteristic. My manual electric flaps & electric trim was too difficult to manipulate in this situation. I had to fly the plane, talk on the radio, fight the crosswind, and hold in the flap and elevator trim buttons, while waiting for the flaps to retract, and waiting until the stick back pressure went away, so I could take-off again! YES, touch & goes were a thing of my past now, at least on breezy/gusty days. I sure loved doing those touch & goes and aborted landings just for fun. Oh well, . . .
Keeping all of this in mind, I think you can identify why I spent my spare time thinking of a way to solve this problem. Well, I'm an engineer, so I solved this problem by developing the FPS-Plus. I hope you enjoy it as much as I do! Flying now is so much more enjoyable. When I add a notch of flaps now, the aircraft just slows down. No dropping of the nose is ever noticed. I regularly do touch & goes, . . just for fun! It has been 5 years since I really felt comfortable doing it in my seemingly nose heavy bird. The second time I flew with my FPS-Plus, I did many touch & goes. I even did one with a 60° climb out with little effort on the control stick from touch down to climb out. It's is now a blast flying with the FPS-Plus! Everything happens so much faster and effortlessly. I don't even use my elevator trim anymore, well, . . only to trim out a cruise leg. The FPS-Plus has four modes of operation, and two modes for programming. After installation, it will be up to the user to decide which one of the four modes that the FPS-Plus will operate. There are different advantages and characteristics to each. Below is a summary. Flap moves only when flap button is pressed. You must keep holding the button for the flap to move. Flap moves only when flap button is pressed. You must hold the button down for the flap to move. Elevator trim moves with each associated flap position. This mode is a little unique. The elevator trim will move proportionally between your programmed elevator trim positions, as the flap also moves between its preprogrammed positions, thus, . . . fully proportional flap and elevator trim control is achieved! Flap moves from programmed flap stop to flap stop. One press less than 1 second (Short Press) begins the movement, up or down. Hold the flap button for more than 1 second (Long Press), and the flap will go all the way to its end stop. The direction will be towards the button pressed, flap up, or flap down. If the flap is moving, to stop it, simply press the opposite command. The flap movement will stop. Mode 4 operates the same as mode 3 for the flaps. The elevator trim moves to its associated elevator trim position for each flap position. In the fully automatic modes, (modes 3 & 4), a “one button touch”, commands the flaps and/or elevator trim to move. This “one touch command” moves the flap from one programmed flap stop, to the next programmed flap stop. Holding the button down for more than 1 second commands the flap to go to either the full up, or the full down positions. If you decide to abort going to a flap position after you gave a command to do so, just give it an opposite command. The FPS-Plus will stop the control surfaces from further movement. Installation is easy! The only items you'll need, is the FPS-Plus, a flap motor assembly, an elevator trim motor assembly, and two position sensors. If you want the position of the flaps and elevator trim to be displayed on your panel, you'll need two position indicators. You can utilize most motors, position sensors, and position indicators that are on the market today. If you want to retrofit the FPS-Plus to your already flying aircraft, you may. You don't have to install any limit switches to your flap system. The FPS-Plus utilizes the output from your "already existing" flap & elevator trim position sensors. Some motor assemblies, like the Ray Allen Company's motors, already have built-in position sensors. If you want to use a position indicator with the FPS-Plus, please read on. Position indicators that are presently sold by various companies, have very different input signal requirements. Some companies have two or more different input ranges. It is unfortunate that no standard exists for these indicators. In order to utilize the wide variety of position indicators with the FPS-Plus, Aircraft Extras, Inc. has developed a small add-on pc board that will also be supplied with each FPS-Plus, at no extra charge. Programming is easy. There are NO limit switches to play around with. Just put the FPS-Plus in mode 5. Position your flaps where you want them, and press the program button. You may store from 1 to 10 intermediate flap positions. It is your choice. The end flap positions will be there by default. Now, change to mode 6. You will notice that pressing the flap up/down button, now moves the flap from your programmed flap stop to programmed flap stop. To program the appropriate elevator trim position associated with each flap stop, simply step thru each flap stop, then manually adjust your elevator trim where you want it, and press the program button. You can even do this in the air to more accurately choose the correct automatic elevator trim positions. 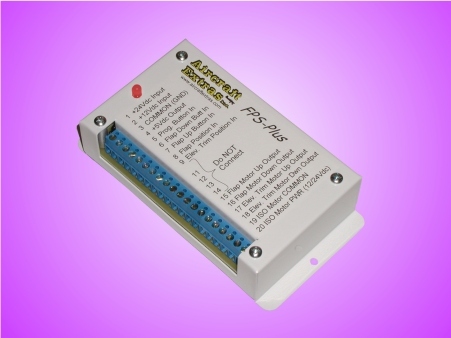 The system will operate on +12Vdc or +24Vdc systems. Maximum amperage for each motor, 10A. Dimensions (overall) 3" x 5.75" x 1.25"
What else do I need to complete the FPS-Plus installation? Does this system come complete with control motors, position sensors, or position indicators? NO, but the good news is; you can connect it up directly to most small aircraft that are flying today, or design it into your present aircraft project. The Ray-Allen Company's systems and other flap motor actuators systems from Vans Aircraft are all compatible. Can I use the FPS-Plus even though I do not have a servo motor installed for my elevator trim? YES - There are selectable modes of operation that do not require the elevator trim. You may also add a servo for the elevator trim control at a later date if you desire. If never want the elevator trim feature, there is a version of the FPS-Plus that does not have the elevator trim feature (FPS-Plus-nt). You cannot up-grade it later though, so be sure before you purchase that version. Can I adjust my elevator trim manually? YES, if you need to fine tune the elevator trim after the FPS-Plus has finished adjusting the elevator trim automatically, you can do it manually. Just wait for 2 seconds after the elevator trim stops moving. Are the Ray Allen Company’s servos and position sensors compatible with this system? YES - The servos even have a potentiometer built into them for position sensing. Are the Ray Allen Company’s position indicators compatible with this system? YES - We provide a small PC board that is used to interface between the FPS-Plus, and the position indicators. One board will drive two position indicators. See the explanation under "Installation". Can I use the FPS-Plus-nt on non-clutch driven flap motors with limit switches? Can I retrofit my flying plane with the FPS-Plus? YES - This might take a little rewiring, but is WELL worth the effort. Probably your biggest challenge, is to find another place to install a redundant flap switch, if you don’t have one already have one installed in your bird. Can I use the FPS-Plus with the TCW Safety Trim? YES! If you purchase one extra relay board and wire it as in the diagram below. Can you use the FPS-Plus and the "Auto Pitch Trim Option" for Trutrak autopilots. Are they compatible? YES! The way the two systems work is as follows. When the autopilot "Auto Pitch Trim Option" is turned on or engaged, it will drive the elevator trim motor to ensure you have perfect trim. This is the case even when you crank in a bit of flaps. The FPS-Plus will try to drive the trim motor, but it will sense that the "Auto Pitch Trim Option " has control. The FPS-Plus will then continue to drive the flaps, and stop its output to the elevator trim motor. No damage will be done because the "Auto Pitch Trim Option" disconnects all other inputs to the elevator trim motor when it is turned on or engaged. When the "Auto Pitch Trim Option" is not engaged, the FPS-Plus will drive the elevator trim servo motor as intended. The way you need to connect the two systems together is simple. Just connect the autopilot "Auto Pitch Trim Option" last. In other words, connect the "Auto Pitch Trim Option" just before the wires go into the elevator trim servo motor. The FPS-Plus and manual trim motor switches will be connected in series just before going into the "Auto Pitch Trim Option". Can I install the program button on my instrument panel, operate the FPS-Plus in mode 6 all of the time? I would like to store new automatic elevator positions at any time during flight? YES, . . . but Aircraft Extras, Inc. does not desire to take any liability of recommending this method of operation. Please read on. HOWEVER, . . We have personally flown the FPS-Plus in mode 6 in our aircraft since January of 2004. It has functioned beautifully without a glitch. We love it. Operating the FPS-Plus in this manner gives the advantage of being able to change your elevator trim programming if your load changes significantly from flight to flight. Most of the time we never need to do this, but if we load "lots of baggage", and take a long trips with that same load, it is an advantage to be able to change the automatic trim position any time you wish. We routinely do it during flight. If your automatic elevator trim position isn't adjusted quite right after the flaps are positioned, all you need to do is manually adjust your elevator trim, then simply press the programming button. This stores another automatic elevator trim setting in the FPS-Plus memory. It works great! We cannot predict or control how any of our products are used by the end customer. Every aircraft is experimental. It is up to the builder to apply and test each and every system in his or her aircraft. If you are going to operate the FPS-Plus in mode 6, here are a few things to think about. I would mechanically limit the elevator trim (if needed) so that the aircraft can be flown safely with any trim setting. Another thing to think about would be to put the programming button in a place where it can't get accidentally bumped by you or another passenger. You might also put it under a small safety door, or put another on/off switch in series with it, etc. Good luck, and please Fly Safe!